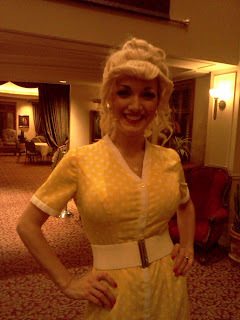 I got the chance to attend a performance of 9 to 5: The Musical at Hale Centre Theatre, and it was FABULOUS! Dare I say I liked it better than the original movie?! It was that good! I am a fan of the original "9 to 5" movie, and was expecting the play/musical to be just as good. I was pleasantly surprised that Hale Centre Theatre did their own additions to the script, and made it even more fun to watch. The actors and actresses did a fabulous job portraying their characters, and the added love interest of Violet, and the crush of Roz on Mr. Hart, was fun to watch play out. If you love the movie, you'll love the musical at Hale Centre Theatre even more! It's playing now until September 29th, so if you want the chance to see it, see it soon! You can purchase your tickets online or at their box office. FREE Backstage Tours: Before the performance, Hale Centre Theatre took us on a backstage tour where we got to see the prop area, costume and fitting room, and underneath the stage. We learned how the props are moved onto the stage by a track and pulley system. Free backstage tours are available to everybody on the first Wednesday of each month beginning at noon. Even though this is a free tour open to the public, you do need a reservation. Call (801) 984-9000. Tours can accommodate up to 60 people. Hale Center Theatre is located at 3333 So. Decker Lake Dr. in West Valley City, across the street from the Maverik Center and next to Hollywood Connection.